There were more dealers and exhibitors at the Kellogg Marine Dealer Trade Show this year than in 2012 after Hurricane Sandy. A year after Hurricane Sandy dealt the East Coast marine industry a heavy blow, organizers and exhibitors at the Kellogg Marine Dealer Trade Show in Connecticut were pleased to see a strong turnout and familiar faces. 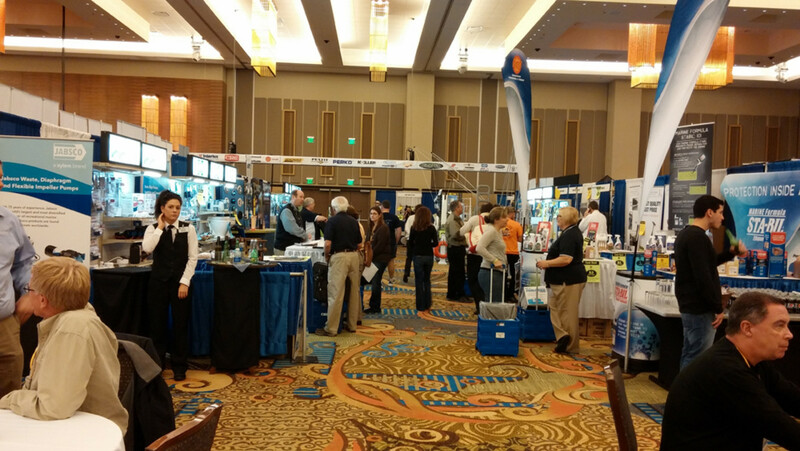 Mike Conners, vice president of national sales at organizer Brunswick Marine Parts and Accessories, said about 175 companies were exhibiting, about 5 percent more than last year. Tom Schuessler, distribution president for the Brunswick unit, said dealer attendance was up an estimated 5 to 10 percent. Exhibitors, many of whom were still busy talking to customers a couple of hours before the show closed, said they did a significant amount of business. Mike Taber, who covers New England from Marblehead, Mass., for Sea Hawk Paints, said at midafternoon Friday that his company had exceeded its show business from 2012 by 50 percent and has been increasing its sales by stealing market share. Jason Kohm, New England regional sales manager for Kidde, a United Technologies Corp. division that makes fire safety products, said he was busy on both days of the show. Attwood Marine national accounts manager Dallas Hodges was displaying the company’s two new MotorGuide brand trolling motors, the X3 and the Xi5, a wireless motor. Exhibitors were optimistic that the industry’s recovery from the Great Recession will continue into next year. 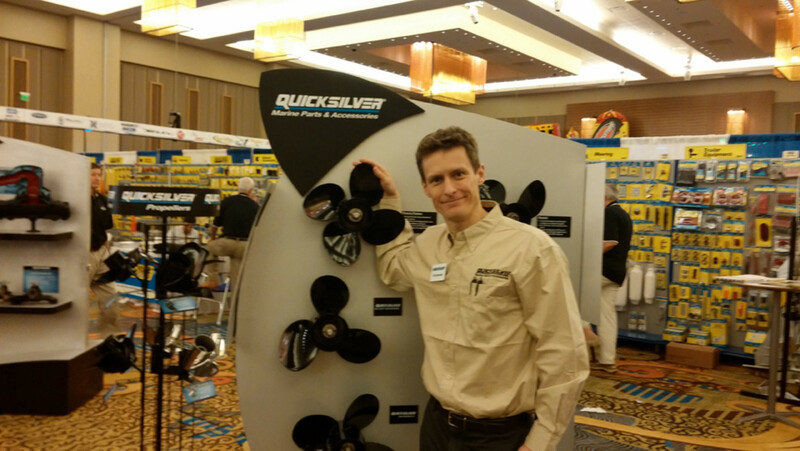 Dirk Bjornstad of Mercury Marine is shown with a display of Quicksilver propellers. Mark Sullivan, a key account manager for wholesale distribution at Lowrance, said the show was “average to a bit above average” for the electronics brand. In his business, growth is tied to new product development, and Sullivan said Lowrance has new multifunction devices on the market for 2014. “What we’re doing is making things more intuitive,” he said. Seeing the bustling show around him, Sullivan was upbeat about 2014, but he sounded a note of caution that suggests the industry will continue to recover as long as it gives savvy customers the value they expect. “We’ve got a good recovery going, but people are wise about how they spend their money,” he said.